If that desktop replacement is a little too thicc for your blood, Acer also revealed a refresh of the Acer Predator Helios 300, the "#1 gaming notebook." It keeps a similar design to the original, but updates the internals. As for the Intel 9th-generation platform, Intel took the stage and gave some vague details about the next-gen platform. Intel's 9th-generation laptop chips will feature Wi-Fi 6 and Intel Optane Memory support on-board. We're not sure which architecture these chips are based on, but Coffee Lake Refresh is a safe bet. Intel will reveal more details at a later date. 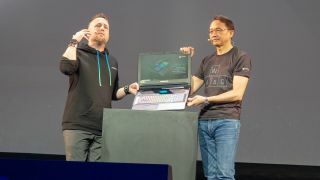 Acer didn't stop with its Predator gaming laptops, though – it also revealed two mid-range gaming notebooks that should be much more affordable. Then, there's the Acer Predator Nitro 5, which has been refreshed with new components, including the latest Nvidia GTX graphics and the same 9th-generation Intel Core processors. This will all be behind a 17.3- or- 15.6-inch display with narrow bezels, along with a 144Hz refresh rate and low response time. We're not sure which GTX graphics will be included, but our money would be on a mobile GTX 1660 Ti and GTX 1650, which appeared in an Acer leak earlier this month. These rumored mid-range mobile chips haven't been announced by Nvidia, but leaked benchmarks are promising.